This is a thread for general discussions about magickal places. (I hope I have posted it in the proper subforum.) I guess most of us have felt that there are some special locations – or stones, trees, etc – that are special and have a certain presence of Earth Power or spirits or something else. The feeling you get from those places can be very different, some magickal locations make you feel full of life, joy and power, other are forbidding, creepy or depressing. Some of them are solemn, others just strange. The purpose of this thread is to discuss the meaning of the magickal places, the different kind of energies that make them magickal and how they could be used in rituals. It would also be interesting to read about your favorite magickal location and your view of it. That could be anything from the pyramids at Giza to the strange stone in your backyard. Or some place that have a special magickal meaning just for you. Since we have to start this discussion somewhere, I will begin with a location not to far from where I live. 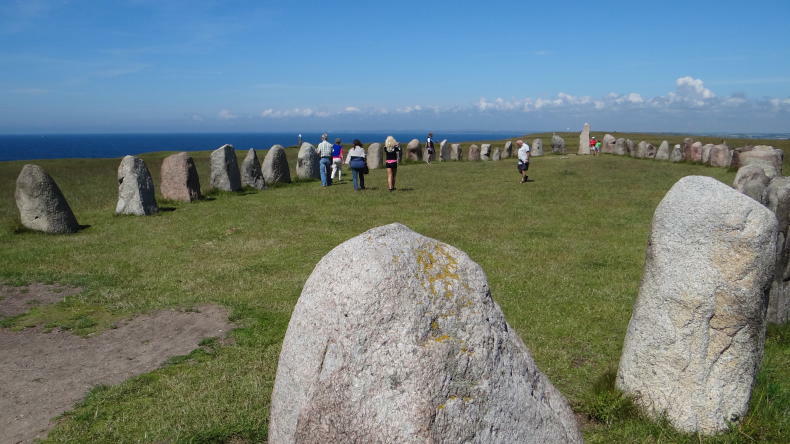 Ales Stenar (Ale's Stones) is a megalithic monument at Kåseberga in southern Sweden, and sometimes called “the Swedish equivalence to Stonehenge”. The Stones were probably raised sometime during the Vendel period (550-790 CE), but could be older. The monument is 67x19 m, and shaped like a ship. It have a very beautiful location at the steep coast with an impressive view out over the Baltic Sea. The monument was obviously used as a burial site, since archeologists have found urns with cremated remains. There's also a theory theory that the site was used for astronomical and/or astrological calculations. This have lead to a heated and sometimes unworthy scientific controversy that I don't wish to be a part of. Today it is a popular ceremonial site for witches and worshipers of the old Norse gods. I can personally affirm that there are very strong energies at this place. The feeling I get is positive and uplifting. I don't know if the energy comes from the Stones or the nature or a combination of both, but I guess the monument was raised at this location because of a presence already there... It would be nice to try to do ritual work there, sometime when one could be alone at the site.